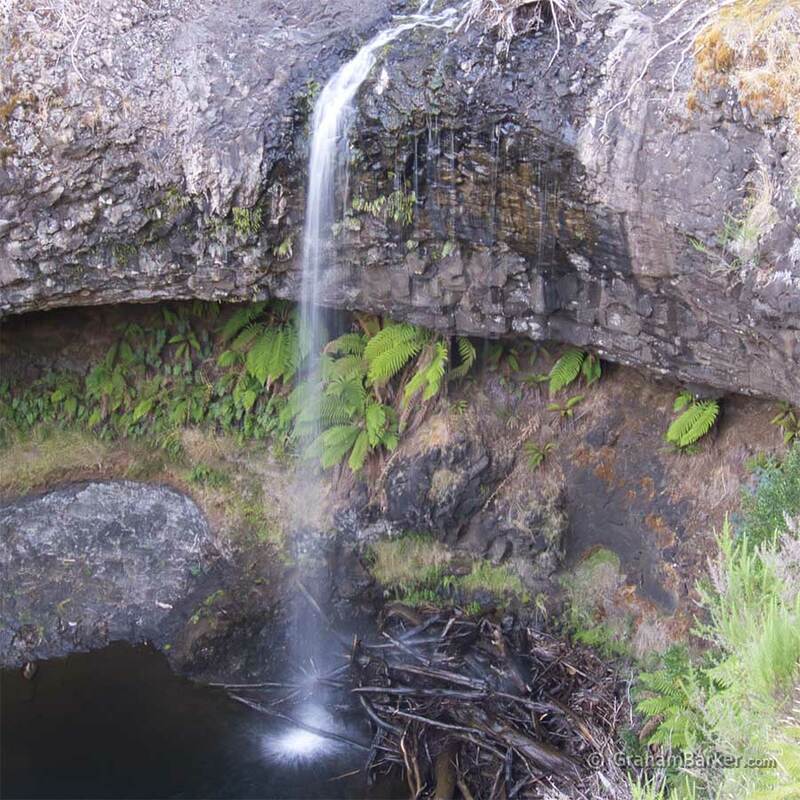 Waterfall afficionados will enjoy the way this Central Tasmanian waterfall plunges over a cliff into empty space - a fine sight even when water flow is low. Visitors may be scarce, but Tarraleah Falls is not far from the main road across the middle of Tasmania, and accessible to anyone who can spare an hour to walk through beautiful forest to get there. Anyone who has driven across Tasmania, between Hobart and the west coast, will have passed close to Tarraleah. It’s just a short detour off the main highway to what was once a hydro town - built to house workers on the local hydroelectric power schemes. Nowadays what’s left of the town is used for accommodating tourists and other groups. The main reason people visit, other than to stay there, is to see the view from the lookout. From an undulating plateau, massive water pipes plunge about 600 meters down the side of a gorge to a power station at the bottom. It’s an impressive view, and a good reason to have a break from driving and stretch the legs. The lookout area is also where the track to Tarraleah Falls begins. First you cross over the massive water pipes, then follow the sign to a trail which disappears into the forest. It’s officially about 25 minutes walk to the falls, each way, but beware: it can take longer. Most of the track undulates gently across the plateau and is straightforward walking. 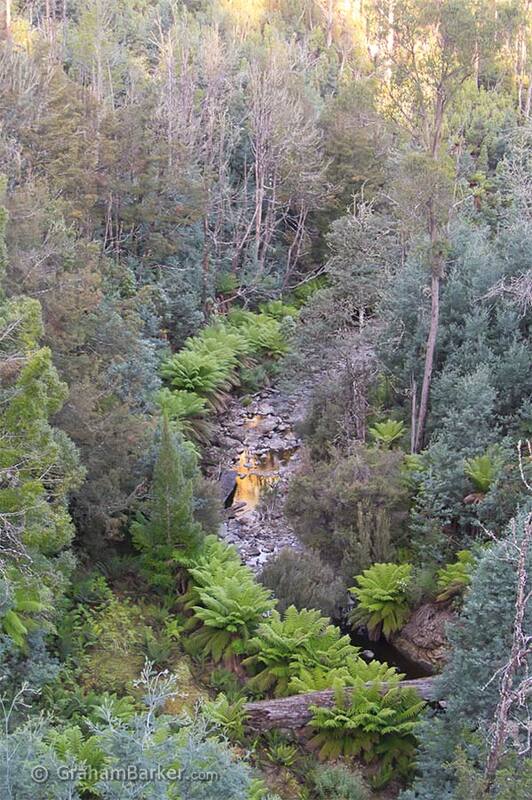 It gets steeper as the path descends to the waterfall, but by Tasmanian standards is not hard. I took it slowly and my dicky knee didn’t protest. Moderately fit walkers on a schedule could go there and back within an hour, including viewing time. On the other hand, photography enthusiasts could spend much longer on this walk. As could anyone who enjoys immersing themselves in nature and taking time to appreciate it. One reason is the forest on the way to the falls - it’s beautiful, despite being damaged in a 2007 fire. The forest has recovered well and continues to bounce back. I particularly enjoyed it just before dusk when some of the native birds - I’ve no idea what they were - put on a sometimes noisy but very enchanting vocal performance to contrast with the peace and quiet. A sturdy viewing platform at the end of the track juts out from a cliff edge, giving good views of the waterfall. 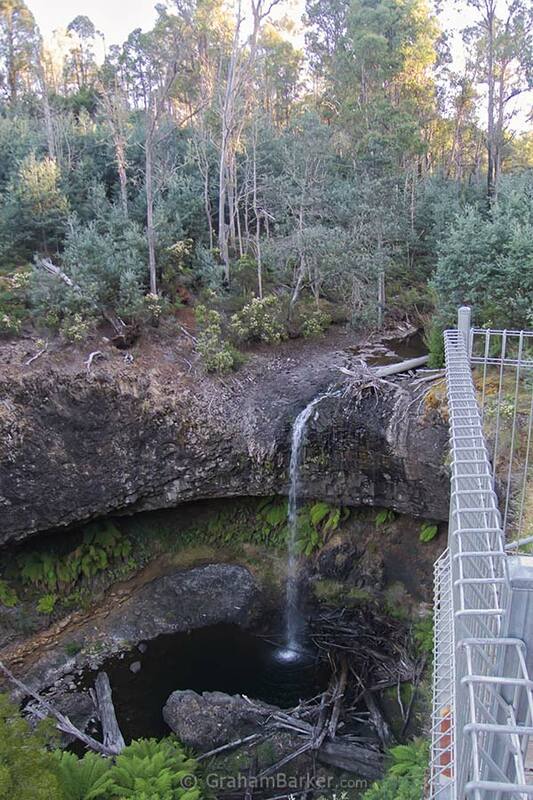 Apparently the Tarraleah Falls also known as Wilson Falls - are a shadow of their former glory due to the water being diverted to generate power. That may be so, but with a 40 or 50 metre drop into empty space I thought it was still very attractive. Especially considering the lack of rain prior to the visit when these photos were taken. So why does Tarraleah Falls get so few visitors? Lack of time would be one factor. Many passing tourists would be travelling between Hobart and the west coast, or Lake St Clair. On a journey of that length there is limited time for detours, and better-known diversions easily consume that time. Lack of awareness is another factor. The falls would be known to those who stay in Tarraleah or visit the lookout and see the sign. 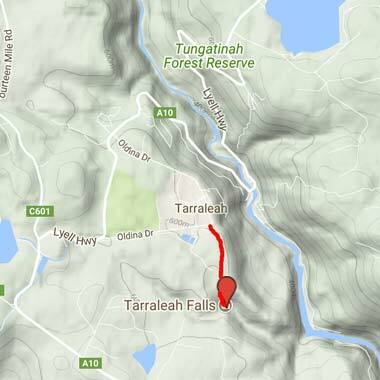 But most don’t - Tarraleah is a detour off the main road which the majority just drive past, unaware of the lovely walk and waterfall they are missing.